The 2019 Miss Spirit Pageant was held on Saturday, January 26th at the St. Joseph High School Auditorium. Saturday’s pageant marked the seventh annual Miss Spirit competition which is held once all the communities have held their contests. It is open to all 1st runners up and offers one more young woman the opportunity to enjoy the many events and activities her sister queens will participate in. Miss Spirit will go on to compete in the Showcase of Queens awards (photogenic, modeling and commercial) at the Mr. Blossomtime and Showcase of Queens Pageant and is eligible to win the Bob Braamse Community Service award, the Queen’s Legacy scholarship, and the title of Miss Blossomtime Congeniality which will be awarded at the Miss Blossomtime Pageant. The 2019 Blossomtime Pageant will be held on March 10th and March 11th at Lake Michigan College, Mendel Center, in Benton Harbor. Eighteen contestants competed for the title this past Saturday. The People’s Choice award voted on by the pageant attendees, was won by Maya Schuhknecht, 1st runner-up to Miss Buchanan. 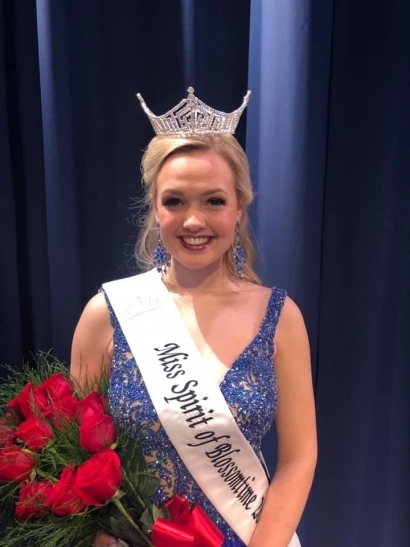 Maya Schuhknecht, 1st runner-up from the community of Buchanan was crowned Miss Spirit 2019. She is the daughter of Jennifer and Michael Schuhknecht and a senior at Buchanan High School. Maya plans to attend Michigan State University to obtain a bachelor’s degree in both Graphic Design and Creative Advertising. Maya will receive a $450 scholarship award and various gifts and prizes for being crowned Miss Spirit of Blossomtime 2019. Maya is Student Council President and Student Body Office President; she is a Youth Ambassador for the Hugh O’Brien Youth Leadership (HOBY); Maya has received The White House/Presidential Volunteer Service Award for completing 109 volunteer hours in 2018; she participates in Varsity Tennis and Basketball, Art Club, Spanish Club and is a member of The Herd Spirit Team.